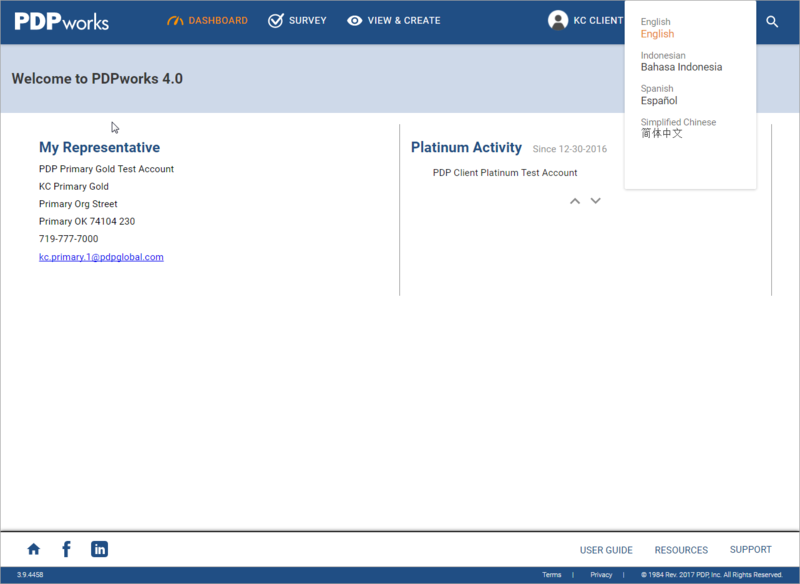 Language resources are a big upgrade to PDPworks 4.0! Whether or not you choose to add additional languages to your PDPworks account (more on that below! ), you have greater access to more foreign language resources in PDPworks than ever before. Previously, you could only supply the survey taker the paper version of the foreign language survey and then manually input the responses. While you can still do that in 4.0, you are now able to send on-line invitations, which allow your survey takers to complete the ProScan in any of 21 languages and the Job Dynamics Analysis survey in any of 12 languages. As before, the report generated will be returned to you in English (assuming that is your default language). If you would like to upgrade your entire PDPworks 4.0 account to one or more of four other languages besides your default language, you can do that as well! 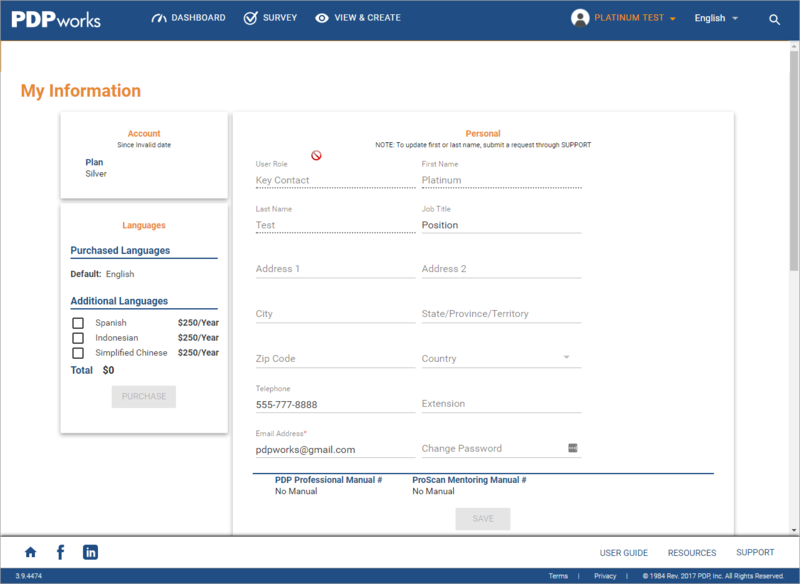 When you purchase an additional language, you are given the option of switching your entire PDPworks app into that language by clicking in the upper right hand corner and choosing that language. Of course, with a simple click you can easily switch it back to English (or your default language). The great part of the additional language feature is that all surveys, email invites, AND reports are written in that foreign language. Also, it is a snap if you want the report printed out in both the foreign language and in your default language. All you need to do is switch PDPworks back to the default language, search for the report, and print it out again. It is that easy! More language will become available over time. At anytime, if you would like to add one of these languages you can do so by clicking on your name in the upper right of the screen and choosing "My Information." On the bottom left of the screen you will see the Language Packages section. There you can choose the language(s) you wish and use a pre-purchase account or your credit card to purchase them for a one time fee valid for one year. Once purchased the language(s) you choose will be available to everyone in your account.